Browse: Home / oilsands / What would it take for Eastern Canada to run on Western Canadian oil? Yesterday, I had a lengthy Twitter discussion with Green Party Leader Elizabeth May, on the subject of oil pipelines and energy security. A few things in the discussion surprised me, and it also forced me to think a lot more about oil infrastructure in this country and to put some numbers to the question, “What would it take for Canada to be oil self-sufficient?” What would we have to put in place to supply all of Eastern Canada’s refineries with Canadian oil? Let’s be clear on a couple of things up front – first, I don’t necessarily think that oil self-sufficiency is the right goal. If we can supply ourselves with oil at a lower net cost by exporting west or south and importing from the east, as we have for years, that’s likely the preferred solution. Second, I’ll have to leave a lot of details out of this post in terms of oil grades, refinery compatibility, etc. Third, I’ll assume that we run the existing Canadian refinery stock at nameplate capacity, regardless of Canadian domestic refined-product demand, with the balance of production going to export. Finally, I’m going to ignore the fact that the Enbridge mainline system runs through the US, and treat it as a potential bullet line from Western to Eastern Canada. More to come on each of those elements in future posts. The second element of the calculation is Eastern Canadian oil production. 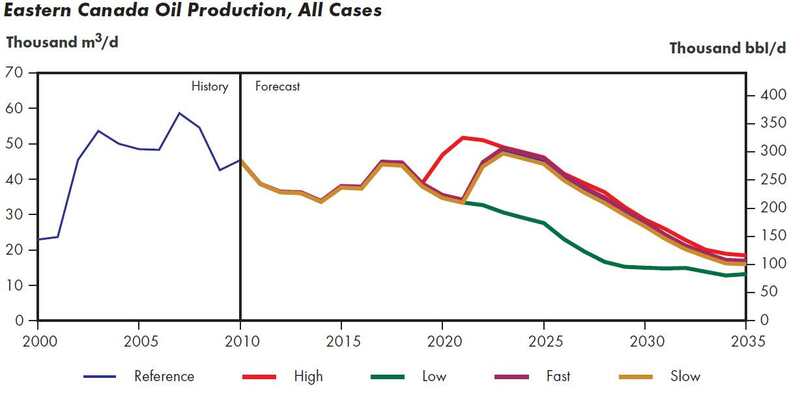 The National Energy Board 2011 forecast sees significant decreases in production over the coming 25 years, with production decrease from about 310,000 barrels per day today to around 100,000 barrels per day by 2035. That means that today, over 1 million barrels per day of Eastern Canadian refining capacity must run feedstock imported from other regions – either by tanker or by pipeline, and that number will increase over time. These figures line up quite closely (as they should) with domestic demand and import numbers. In January 2011, for example, the total domestic crude oil demand in Eastern Canada was 1.15 million barrels per day (combined heavy and light) while total imports were 660 thousand barrels per day, with the balance supplied by domestic production and western Canadian crude oil. Bottom line – in order for Canada to be self-sufficient in terms of feedstock for our our existing refineries, we’d need to increase west-east crude movements by 600kbpd today, and by at least 800kbpd within the next couple of decades. If we simply wanted to set the bar at supplying enough crude to refine for our domestic consumption, that number decreases by about 60%, since during the same period (January, 2011), we exported about 475kbpd of refined products out of Eastern Canada. So, what existing pipelines are in place which could make this happen? There are three major pipeline systems that currently bring crude oil into eastern Canada: the Enbridge Mainline (722 kbpd on Lines 5 and 6b) which terminates at Sarnia/Nanticoke, Enbridge Line 9 (240kbpd, connected to the mainline), and the Portland-Montreal pipeline (140kbpd). In order to serve existing demand in Eastern Canada with Western Canadian crude, you would need significant changes in infrastructure, including the addition of new pipelines. Assuming that Eastern Canadian production remains sufficiently high to feed the Come-by-Chance refinery, you would need a reversal of Line 9, complemented by an additional 500-600kbpd of capacity between Superior, Wisconsin and Montreal along Enbridge Mainline and Line 9 routes. You’d also need new pipelines with 500kbpd of capacity from Montreal to Levis, with 400,000 continuing capacity to Saint John. As Eastern Canadian production declines, you’d also need a pipeline linking Saint John and Dartmouth to deliver 90,000 barrels per day. That’s a serious amount of new capacity. What would that look like? Well, you’d need to install a 34-36″ line both between Superior and Sarnia, perhaps on the existing path of Line 5 (I doubt you’d get a lot of buy-in to twin Line 6b right now) and also on the existing right-of-way for Enbridge Line 9 if feasible, or on a new right-of-way, to Montreal. You’d likely continue with the same design through to Levis with a likely 30″ line running from Levis to Saint John – the project would likely be about twice the scale of Northern Gateway, as it would have to cover 1500-2000km of distance with similar diameter pipeline. So, is it feasible? Yes, it’s absolutely feasible, but there are other issues which I’ll discuss in future posts. First, most of the refinery capacity in Eastern Canada is not equipped to run heavy and high-sulphur feedstocks produced by the oilsands, although refits would be possible. Second, assuming that some refits would be undertaken as a less costly alternative to upgrading prior to shipping, additional pipeline capacity might be needed to return diluents used to ship oilsands bitumen. Finally, and perhaps most importantly, there would be the issue of tolls and pricing. If you’re considering moving western canadian crude over 5000km to eastern canadian refineries located on tidewater ports, the key question would be who pays for that self-sufficiency? The transportation costs would likely be $12-15/bbl, meaning Alberta producers would consistently get $12-15 below the world price, or domestic refiners would pay more than what they could pay to access crude right off their shores. Figuring out that issue might be just as challenging as building the pipelines, as one of Ms. May’s tweets suggested. I can’t imagine this will be the last post I write on this subject, but I hope this was an informative start. This is new research for me as well, so your comments on infrastructure alternatives are most welcome. Interesting article. Although Andrew does a good job of showing the massive undertaking of moving tar sands oil east I still think that the environmental costs of moving oil west, to China, through an,as yet, pristine mountain and ocean area has not been adequately factored in. I don’t know whether that is possible in todays economic climate but, for the sake of future generations , I sincerely hope so! Thanks for your input Andrew. You certainly remind all of us that this is not an issue that has simple solutions. You wouldn’t need additional pipelines. The oil can be refined at it’s source in Alberta and Saskatchewan. So – a gigantic fleet of gasoline tanker trucks criss-crossing the Trans-Canada? Or am I supposed to drive to Calgary to fill up? I think Gordon’s has covered this, but I’d add couple of additional questions. First, you would mothball existing Eastern refinery capacity or would you keep processing imported oil? Second, even if you refined in AB and SK, you’d still be looking at about 3-5x higher transport cost per barrel by rail than by pipeline to get the product east. You’re strictly correct that we don’t “need” pipelines and that we “could” refine it where it’s produced – we could, if we wanted to provide really expensive gasoline to the East coast, and substitute employment in the hottest labour market in the country for employment in some of the slowest. That doesn’t seem like something that’s up your alley. Perhaps you were considering transportation by bucket brigade? First of all, we’re discussing unrefined oil, not the refined product. But as to that, the refined product still needs to be transported from the refineries whether they’re in Alberta, Ontario, Texas or China. It doesn’t create additional costs but actually reduces costs by eliminating the unnecessary step of transporting the oil over long distances. I’ve written a blog post outlining what I believe to be a more feasible and economically sound plan. Read my post a little more carefully, and check back on the Twitter conversation. Ms. May’s comment was that existing pipeline were in place to feed existing Eastern Canadian refineries with Alberta crude. I don’t believe that to be the case. Nowhere do I suggest that I think this is the preferred option – in fact, if you read the post, you’ll see that I say EXACTLY the opposite. Put some numbers to your post – cost per barrel of product mined and refined in Alberta at a new, greenfield refinery built in Alberta, and shipped to Montreal as gasoline vs. product mined in Alberta, shipped to Montreal as dilbit, and processed in an existing refinery with a coker refit. If you like, put the intervening case of upgraded product in Alberta, at an integrated upgrader/mine site (i.e. use the difference in cost between dilbit from a bitumen-only mine vs. SCO from an integrated mine), shipped to Montreal as synthetic crude, and again refined in an existing refinery, this time with no refit necessary. I could do these numbers for you, but you won’t believe them, so I’ll leave you to do the research for yourself. The reason US refinery capacity is more competitive right now is because it exists already, not because it is cheaper to build. Look up transactions costs for recent refinery sales in the US, and by contrast, look at the costs for building a new site in Alberta (again, I could give you these, but you’d not believe them). The same is true in Eastern Canada as is true in the US – refineries exist, and could be refit at a fraction of the cost of building new, especially if you assume that the alternative is seeing the eastern Canadian refineries mothballed because the market is being served by western crude. Let me know when you compare the numbers. This is a discussion we need to have. You have painted the landscape with your usual precision. Now we need to colour it. Lets think about the value of spreading Canada’s upgrading capacity to provinces that have plenty of hydro power, hence offsets. Lets think of job creation in jurisdictions that need it. Lets think of joint research to improve the sustainability of our refining park (which, as you point out, would need to be adapted to a different crude. And lets stop conducting our analysis of oil markets in absence of politics. Approximately 80% of the oil resources are in the hands of national governments through state-owned enterprises. Like it or not, that means something. Lets think about all the implications, without paranoia. I am not suggesting it is bad, simply that decisions on production and pricing, investment, research, etc.. are made differently. In fact, the reason we have “historically” exported Western produced oil through Sarnia and imported oil to Montreal was in response to an arrangement between Diefenbaker and Eisenhower which exempted Canada’s oil from US import duties. That said, we do need to ensure we have a value proposition. How do we add nation building to this proposition? Another risk lies in the declining demand trend for refined petroleum products in the east. In Quebec for instance, demand has been flat or slightly declining in the last few years, because an increase in gasoline demand was balanced by reductions in #2 and #6 oil. This was one of the factors behind the closure of the Shell refinery in Montreal-East in 2010 (the others are the small size of the complex, the scarcity of supply and the age of the facility). Regarding politics, I don’t know how you’re going to sell “nation building” to my compatriots. The boys from the oil patch tried it with shale gas and they ended up empty-handed. At the end of the day, buying crude oil from either Alberta, Algeria or Norway is a drain on Quebec’s trade balance. Andrew: Your table on refining capacity in the east is somewhat out of date. According to the Quebec Department of Natural Resources and Wildlife (French), there are only two refineries left in Quebec. Suncor in Montreal (140 kbpd) and the Ultramar (Valero) refinery in Lévis (which has been recently upgraded to 265 kbpd). Great comments on all fronts (as usual). Thanks in particular for the correction. I found multiple sources which had that refinery listed, despite my own intuition that it had closed. Should have looked harder. I think you raise good points about refined product demand in the East, which raises the question of whether our existing refinery stock is actually sustainable. The signs say no, but that was not the spirit of the discussion with Elizabeth May, so I didn’t really take it on in the post. There is, I believe, an argument to be made for leveraging existing assets in Eastern Canada if possible to increase the value we generate with our resources, rather than allowing those rents to be exclusively earned outside of our jurisdiction. Right now, significant rents are being captured by those with existing or easily retrofit refinery capacity to process heavy sour feeds, and so it’s the right question to ask whether we could/should enable some of these rents to be captured within Canada. I still tend to think we should price the bitumen correctly and let the market decide, but many people seem to see value in “processing” our natural resources here, so I thought I’d jump in to the debate a little. Per your last comment in the thread. Sorry, didn’t mean to imply my post was a rebuttal of your post. It was merely an expansion on my earlier comment. As far as numbers go, that’s beyond my ability. But they ones you want are a moot point since I’m not advocating moving oil or gasoline east; though I do leave the possibility open. As for the refineries, the eastern ones would continue operating as they do now since the refined gasoline would go to either the US or west coast for sales overseas. Also note that my plan in the short and medium term is to build refineries to refine oil from expansion, not existing operations. So the new refineries would simply be built here instead of increasing capacity in the US. Understood. If you use words like, “more feasible and economically sound plan,” and, “it doesn’t create additional costs but actually reduces costs by eliminating the unnecessary step of transporting the oil over long distances,” then the numbers do become relevant. The question of the tradeoffs between refining costs and shipping costs is the core of the issue since, as you and Claude point out, some of the refined product would be shipped to markets where there are already refineries. With respect, I don’t think you can have the discussion without the numbers. I disagree on the necessity for numbers. All things being equal, if you mine the oil, transport it to Texas for refining then transport the gasoline to China it will cost more than mining the oil, refining it on site and then transporting the gasoline to China. The elimination of an entire step in the process is cheaper or at worst, the same. Robert, if you are going to claim that X>Y, without being willing to back it up with numbers for X and Y, then it’s simply your opinion. Put some numbers to the cost of 2 barrels of gasoline and 1 barrel of diesel/heating oil (a standard refinery measure behind the 3:2:1 crack spread) delivered to Fujian, China from Canada by pipeline and tanker vs. a barrel of synthetic crude upgraded in Alberta, pipelined to the coast and tankered to Fujian then refined vs. a barrel of dilbit shipped by tanker to Fujian and refined including the costs of returning the diluent. As you wish, you can assume “all else equal”. I’ll look forward to your calculations. You push economists all the time to back up their theories with data – it’s time for you to back yours up to. For the record, I am not saying you are wrong, but I know you won’t believe the numbers if I put them up, even if I do have support. Don’t mean this to be insulting, but am I wrong to assume you understand algebra? I only ask because I can’t understand how you fail to see that a+b+c+d is greater than a+c+d without seeing actual numbers. If that’s what you meant by “all else equal” than you’re correct. If refining costs exactly the same amount everywhere, you’d only ship refined products. If you want to assume that, then your analysis is tautological and irrelevant to the discussion about where to upgrade and or refine oil in a world where all is not equal. In that kind of a world, the relative volumes transported trade-off against the costs of refining at source vs. at destination. I’m sure there are many places where you can get away with an assumption that all-in refining costs at a new refinery in Alberta are the same as at a new refinery in China or in an existing refinery on the Gulf Coast or in Eastern Canada, but this isn’t one of those places. It’s not insulting at all to suggest that I don’t understand algebra, since I think that’s demonstrably false. What remains to be seen is whether you’re willing to challenge yourself to learn something about the market and support your conclusions. If you are, than I hope you will share it with us. I am not insensitive to the massive costs of building new infrastructure. Neither am I oblivious to the risks. I do believe, however, that if we are to realize the full potential of our energy resources/economy in Canada (not just Alberta), we need to have an informed conversation. Finally, on the Quebec and Alberta conversation, it is time to turn a page and figure out how to build something together. And the same is true for Ontario and all other provinces. If anyone has good ideas, do put them forth. We know what the problems are, it is time for creative solutions. On that, Andrew, thanks for your dedication in talking to everyone, and for your imagination and hard work. I am certain solutions will be offered and in no small measure, because people like you are ready and open to engage. You rock my friend! The cost of building new refining capacity in North America is roughly $1 billion per 50k barrels/day refining capacity. Therefore all things are equal and refining at source is cheaper. Wow. Based on who’s numbers? Please reference any cost estimate for building a new refinery in Alberta at 20,000 per flowing barrel. I am sure Suncor would be happy to hear from you, considering they are over 3 times that in terms of the cost of their Voyageur upgrader. NWU upgrader/refinery is expected to cost 5 times that for a 50k bpd complex. All is not equal, and numbers do matter. Would love to see you back up your figures – thing is, I know you can’t so I don’t expect it. Oops. I should have pointed out my survey of costs was for refineries that process conventional oil. But if those are comparable then the cost of refineries that process oil from the tarsands would also be comparable. The addition of a coker unit at Suncor’s Montreal refinery was estimated at $1.5 B back in 2006 (link here). Building a new refinery from scratch would be much more expensive. Keep digging, Robert. The last new refinery built in North America was Shell’s Scotford refinery, built to process oilsands crude, in 1984. According to the EIA, “the newest significant (or sophisticated) refinery began operating in 1977 in Garyville, Louisiana.” You may wish to read up on that here: http://www.eia.gov/tools/faqs/faq.cfm?id=29&t=6. So, exactly which new refineries did your survey cover? Those built prior to 1977? All the recent estimates average out to about $1 billion / 50k barrels per day capacity. You know what, I withdraw my previous oops. The mistake is yours. You switched from talking about refineries to talking about upgraders. As far as my average estimate goes, I looked at them from different regions of North America. They were all close to the $1 billion/50k capacity cost. It’s hard to get data on refinery builds since 1977. Care to share any? Stop to think that, maybe, you need a refinery to cost that little to make it viable so you look to build in regions where costs are low? I guess, if it costs the same everywhere, that’s not a concern. Anyway, please share your data on construction costs for refineries across North America. Will be interested. Hint: Don’t bother looking at the graph. it’s 0. Why not build closer to the production growth, in North Dakota? http://www.eia.gov/dnav/pet/hist/LeafHandler.ashx?n=PET&s=MCRFPND2&f=A Since it costs the same and is preferable to build closer to the source? Why not build closer to ND. I’d say it’s because ND’s oil is already going to ND’s refineries. There’s no point in building more at source refineries when there are enough of them already. As for why they would build those refineries in the middle of the Arizona desert I’d bet without even looking it’s because the location is close to an existing or proposed pipeline. So again, why build a refinery in the middle of Arizona, which does not produce oil, and then ship oil there to be processed, if refineries cost the same everywhere, and it’s always more profitable to refine at the source? Curious to know how the pipeline from Levis, QC to Saint John, NB is 1500 to 2000 km, if only the drive is roughly 700 km? I recall that there was discussion to develop a natural gas pipeline from Saint John to Quebec, it seemed feasible, especially to introduce gas to a whole new region, however, it was a small market compared to exporting to Maine. Good question – the confusion is the product of my awkward sentence structure. The 1500-2000 was meant to be the overall distance which would need to be covered by new pipe – from Sarnia to St. John, which is 1730km following the 401, 20, and TransCanada through NB. The range was meant to reflect the fact that I didn’t actually map the potential right-of-way. Long story short: in 1978, Trans-Canada applied for the extension of its pipe to the Quebec City area with a view of expanding to the Maritime province by 1985. A distinct proposal by a group called Quebec & Maritimes proposed a project to immediately expand to Halifax. The concurrent proposals were merged and studied by the NEB. In April 1980, The Trans-Canada part — Saint-Lazare to Saint-Nicolas (now part of Lévis) was approved but the Q & M part was denied. I have often considered if what I am about to propose would be beneficial to Canada from a, “energy self-sufficiency” prosepective and if it would make economic sense…. Would it make sense to build a pipeline right along beside the natural gas pipeline that is entirely in Canada (the one that goes north of Lake Superior) to carry refined oil to eastern Canada. Or, the new pipeline could carry crude and we could build a massive refinery in Ontario? Would this make sense? Good question. I guess it depends on how much you are willing to pay for energy self-sufficiency. There are two potential reasons this might have legs – first, the TCPL natural gas pipeline will see falling shipping volumes, and with increased eastern north american gas reserves, there is less compelling reason to ship gas east. Further w declining Alberta production and increased Alberta demand, you could potentially make a case to re-task that gas pipeline to oil. You could also make the case to use that right-of-way for another oil pipeline, but you add transportation costs vs. following the ENB mainline route, although the trade is that you would be staying on Canada’s side of the border. Whether or not you’d want to build another refinery in Ontario is another question. There are some brownfield sites of former plants you could resurrect, potentially. Thank you for your kind response to my question. I was especially gratified by your, “this might have legs” comment, being that I feared my question would have a person of your ‘energy expertise’ rolling in laughter because of it being such an idiotic idea. I have always had great admiration for the courage of The Right Honourable St. Laurent and Mr. Howe in building an all Canadian Natural Gas Pipeline. I use this blog to formerly call upon Mr. Harper to keep the natural gas pipeline built by Mr. St. Laurent and twin it with a new crude oil pipeline. (The first one could be red and the new one blue, hee hee)And then a massive new refinery could be built around Sudbury. We could reduce everybody’s fuel bill in Ontario, Quebec and the Maritimes by using WTI priced crude, we could free eastern Canada from foreign oil, and create thousands of jobs with one bold Canadian initiative! My Fellow Countryman Do You Stand With Me? Two things – one, if you move product east (or west or to the Gulf coast) instead of into the midwest, you’ll decrease the WTI discount. Second, even if there were a WTI discount, there is no reason for Ab producers to pass that on to Eastern Canada or any other non-stranded market. If the marginal barrel in a regional market is Brent-priced tidewater oil, that’s the price that all barrels will command (absent long-term contracts, obviously). I wouldn’t make the case based on access to Alberta crude at below world prices, nor would I make it on the basis of decreasing the cost of gasoline. Making better use of Ontario’s human capital might be a better way to think of it. Thank you Andrew, I have a very keen interest in acquiring a knowledge of the crude oil market mainly because I have concluded that our prosperity at this epoch in human history is inextricably linked to the price we pay for oil ergo I am glad I found your blog. I will take my time to persuse all your articles. At the moment, I am unable to predicate my belief that twinning the TCPL with a crude oil pipeline upon as much facts as perhaps such a belief should properly be based upon however at the moment, I believe that common sense alone can make a cogent argument for a sovereign, all Canadian pipeline being built, to protect the citizens of central and eastern Canada from the vagaries of foreign crude suppliers. Not to mention the very large number of high paying jobs that would be created in building the pipeline and the long term jobs created by the building of a world class refinery in Ontario. I just read an article entitled, ‘Canada Exports Jobs Along With Its Oil,’ by Frances Russell from the Winnepeg Free Press, January 25th, 2012. Ms. Russell wrote with penetratingly keen insight, and as a result, I am much more cognizant of why policy makers in Canada defer in favour of the interests of multinational oil companies rather than making decisions that are in the best interest of the ordinary citizens of central and eastern Canada when it comes to oil security. In light of this information, I have concluded that my hope of a All Canadian Crude Pipeline (going north of Superior) will never happen. Although I still believe in it..
My question to you is as follows…Generally speaking, I am in favour of governmental decisions that are biased in favour of big business because they are more likely to invest and expand business and as a corollory will produce more jobs and increase prosperity. BUT, because of our dependance on petroleum, should the Canadian government make and exemption in the case of oil and focus upon National Energy Security? Perhaps there is enough oil to first of oil achieve Canadian oil security and then allow large oil companies to pursue profits where ever they can best generate them? I guess the question is what you mean by energy security. If you mean a domestic price insulated from the world price, I think that would be a terrible idea. The concept of “energy security” is a tough one to pin down – it’s like the smart grid in that everyone uses the term to mean something different. I’m generally in favour of the idea of going east with more oil than we do, but certainly not in order to ensure lower oil price. If the worry is that multinationals are getting too good a deal on our oil, then correct that problem by charging the correct price for our oil. Thank you Andrew. By, “energy security” I mean, “supply security.” In my opinion, we need to make decisions based upon free market economics AND national supply security for every region of the country. To me its a no brainer, we are a net exporter of oil, so lets pass a law that we only export what is left over AFTER each citizen of Canada is assured a steady supply of Canada’s oil. Andrew, can you explain this one to me? The oil companies in Alberta are trying to find ways to sell more oil, (ie Keystone to the gulf, and the pipeline to Kitimat, sorry about the spelling). Well, we have a market right here in Canada, and it is Ontario, Quebec and the Maritimes who are forced to import oil from foreign countries. Why don’t the oil companies exploit this market? We don’t have to get President Obama’s approval for that pipeline? That will have a duel benefit, it will provide a ‘market price paying steady customer’ for the oil companies and it will provide national, “supply security” for Canadian citizens in central and eastern Canada? Supply security is really a misnomer – if supplies were limited, prices (either regional or global) would adjust to equate supply with demand. The rule you suggest is already, effectively, in place via the market – if Canadians are paying the world price for oil, then there is no reason to (net) export oil which Canadians would be prepared to consume at those prices. So, either you are talking about one of two things – a lower, domestic price for oil in Canada, disconnected from the world price, with the remainder to be exported, or a mandate that all Canadian consumption be supplied by Canadian oil, even if that means incurring extra transportation costs. If we can export to Chicago and import at St John, and end up paying less (net) for the oil we use, why would we not do so? It seems to me that you are basically arguing that we should insulate the Canadian market from the world market, which I think is a bad idea. Sure, it might benefit Canadian consumers with cheaper oil, but it will cost canadian producers and canadian governments revenue and tax dollars on oil. At the margin, we’d be supplying oil to Canadians which they value less than what someone else would pay them for that oil. I don’t see why we’d do that. Hi Andrew, I hope I dont seem importunate, but if convenient, could you answer my question regarding Ontario? The question I posed on February 28th. Thank you Andrew. I understand and appreciate your answer. If we leave the oil decisions to the forces of supply and demand, we may find that Canadian citizens get, “priced out” by more prosperous countries that are able to pay more for it. (Goverments who have the money to subsidize the cost so their citizens pay less than market price).Therefore Canadians cannot afford to use their own oil at world market rate because of the forces of supply and demand and other citizens from more prosperous economies are using that oil at a cheaper than market rate because of their government’s subsidies. If there are others willing to pay more for our natural resources than the value we can derive from them domestically, then restricting their sale to Canada reduces their value and reduces Canadian average real incomes. If you’re talking about implicitly (via trade barriers) or explicitly (via financial/tax incentives) subsidizing the consumption of Canadian oil, than I disagree entirely. Sure, if world oil prices increase, those who consume more oil than they produce will be worse off. That’s not us. The question of how those gains are redistributed is a valid one, but one should not argue to make the pie smaller because some people don’t currently get a large piece. Firstly, regarding economics…We may find that the broader economy of Canada may expand exponentially if we assure it of a steady/safe/reasonably priced supply of domestic oil. But,(having written that) I am acutely aware of my inferiority to debate economics with you. However, I propounded ANOTHER REASON for adopting a more, “Nationalisic Canadian Oil Policy,” and I find it interesting that you have not addressed it with your responses. The supply of crude to Central and Eastern Canada is so ineffably crucial that I believe it is irresponsible to make all the decisions based upon supply and demand, free markets and what’s best for the oil companies. If, for some reason, those foreign oil tankers can’t pull up to the east coast to supply Ontario, Quebec and the Maritimes with oil, (and there are many reasons why that could happen), we are going to wish we had the presience to build a safe, reliable, domestically controlled pipeline north of Superior. You need to think about the foregone value of subsidised oil prices. Sure, if we offered Canadian oil to Canadians today for $50, those Canadians who use more oil would be made better off, assuming that all else could be kept equal…the problem is that all else would not be equal. You would lose significant real income and wealth by doing so – oil producing firms and/or governnments would be foregoing the value in the oil they could otherwise sell for $100, and that impacts all Canadians directly (think services, pensions, RRSPs, savings, etc). You can make these direct arguments about subsidising anything – housing, food, clothes, etc. Subsidies always look good if you don’t take account of who is paying the bill. In this case, it would be all Canadians giving up $100 to accept $50 for every barrel of oil we produce and sell in Canada. It’s a losing policy in the long term. Further, you’re sending the wrong long-term value signal – you are encouraging people and businesses to invest in a way which ignores the true value of the oil, so you further lock-in the need for further subsidies. Physical supply disruptions are a reasonable consideration, but even if we had a pipeline west-east, in the event of a major supply disruption, you’d have a case again where you could decide to keep Canadians in cheap oil or sell expensive oil and use the revenue to make Canadians even better off. If you stop the calculation half-way, by saying it would be great if we had access to cheap oil, you’re ignoring important information. Would the economy still grow “exponentially” under a national oil policy with below world prices? Yes. It would simply grow at a lower exponential rate than if you didn’t have that policy. You have been very illuminating. I’m in over my head. I’m going to do more study and then challenge you again. By the way, in the event of a supply disruption. (if we did in fact have a west/east pipeline) I don’t think we will be having a lofty debate whether to, “keep the cheap oil” or “sell the expensive oil.” I think we will be tying to avoid anarchy. Seems like the Alberta Wildrose Party is interested in this debate. Perhaps the Wildrose wants to be friends with the East and not let them freeze in the dark. Below, I have referenced an article I read this morning that I found particularly illuminating. I have been following the trials and tribulations of the Canadian oil industry for a while. While no expert on the subject, I can see that it is going to be economically unfeasible to ship western crude by either rail or barge from Montreal to the Irving Oil refinery in Saint John, NB. Recently here in Maine there has been much discussion about the creation of an East/West highway by foreign investors which is being promoted by the Cianbro Corp. in Pittsfield, Maine. Cianbro retools paper mills and builds and maintains bridges for highway projects. Cianbro also builds equipment for the oil and gas industry. The proposed route would lead from Coburn Gore, ME (just south east of Lac Megantic, PQ) and end up in Houlton (a stone’s throw from St. John, NB). With every article I can find on the subject telling me that the oil companies in Canada are eyeing Irving’s refining capacity, and Cianbro being the company here in the States pushing for this project, I can’t help but think that this highway project is actually a pipeline project. Has anyone found anything that would disprove my theory? There’s an existing Portland to Montreal pipeline, so I can’t see any reason that a hypothetical project to reverse that would not be the first step. Beyond that, I would expect you’d see an expansion on the same right-of-way. What would it take? The will to overlook the environmental devastation that results from tar sands production. The will to overlook accelerated climate change caused by the extraction of tar sands oil, the destruction of the carbon sink that is/was the boreal forest, and the continued burning of fossil fuels to power trips to the corner store for a creamy, etc. The will to look the facts in the face and say “Ha!”. The will to set aside compassion for your fellow human and for the well being of future generations for short term profits. The will to utterly waste the most important source of finite fuel on the planet; the will not to use it for the creation of renewable energy sources but instead to power our ‘4 mile commute to work’. This thread and the complete lack of humanity represented herein makes me ill.